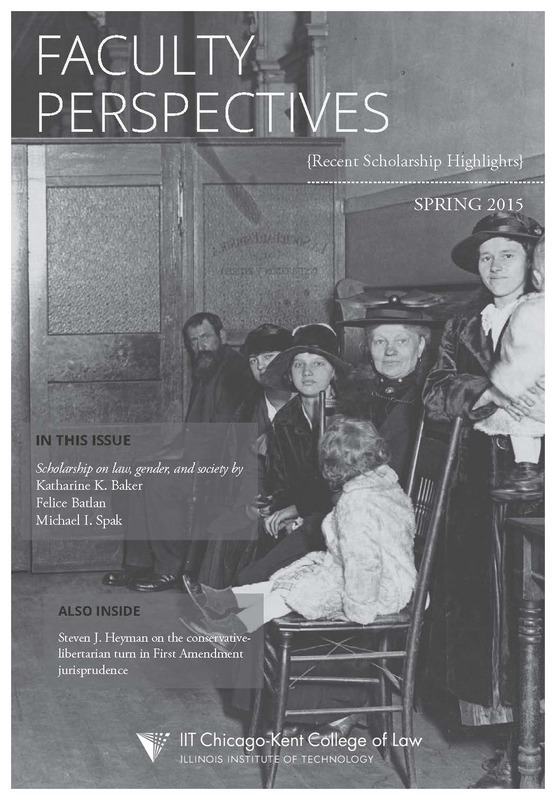 The newest edition of the Chicago-Kent Faculty Activities Report is online. Take a look here. Kimberly Bailey‘s article, It’s Complicated: Privacy and Domestic Violence, will be published in Georgetown’s American Criminal Law Review this fall. Christopher Buccafusco‘s article, Making Sense of Intellectual Property, was recently published in Cornell Law Review. His forthcoming article, Well-Being Analysis vs. Cost-Benefit Analysis, written with John Bronsteen and Jonathan Masur, has been accepted for publication in Duke Law Journal. The article will be the basis for the journal’s annual Administrative Law Symposium next year. Nancy Marder’s book chapter, entitled Instructing the Jury, was published in The Oxford Handbook of Language and Law (Peter M. Tiersma & Lawrence M. Solan, eds. 2012). Joan Steinman's article Appellate Courts as First Responders: The Constitutionality and Propriety of Appellate Courts’ Resolving Issues in the First Instance is about to be published in Volume 87 of Notre Dame Law Review. Professor Steve Heyman has posted his new article "To Drink the Cup of Fury: Funeral Picketing, Public Discourse and the First Amendment" to ssrn. The article will be published in the Connecticut Law Review. In Snyder v. Phelps, the Supreme Court held that the Westboro Baptist Church had a First Amendment right to picket the funeral of a young soldier killed in Iraq. This decision reinforces a view that has become increasingly prevalent in First Amendment jurisprudence – the view that the state may not regulate public discourse to protect individuals from emotional or dignitary injury. In this Article, I argue that this view is deeply problematic for two reasons: it unduly sacrifices the value of individual personality, and it tends to undermine the sphere of public discourse itself by negating the practical and normative conditions on which it depends. I then present an alternative theory of the First Amendment which holds that the same values of human dignity and autonomy that support freedom of speech also give rise to other fundamental rights. It follows that speakers generally should have a duty to respect the personality and rights of others. Drawing extensively on the record in Snyder as well as other materials, I argue that the First Amendment should not protect Westboro’s funeral picketing because it is intended to condemn the deceased and to inflict severe distress on the mourners in violation of their rights to privacy, dignity, and emotional well-being. Finally, I show that while Westboro prevailed in Snyder, this may prove to be a Pyrrhic victory, for the Court also suggested that states can protect mourners through carefully drawn buffer-zone laws. The great folks over at the Written Description blog have posted a review of my article Making Sense of Intellectual Property which has just been published in the Cornell Law Review. Take a look at the write-up and the rest of the blog. John Bronsteen, Jonathan Masur, and I have just posted our newest happiness-related paper to ssrn. The paper, Well-Being Analysis vs. Cost-Benefit Analysis, will be published in the Duke Law Journal, and it will form the basis for Duke’s annual administrative law symposium. You can download the paper here. Cost-benefit analysis is the primary tool used by policymakers to inform administrative decisionmaking. Yet its methodology of converting preferences (often hypothetical ones) into dollar figures, then using those dollar figures as proxies for quality of life, creates systemic errors so large as to deprive the tool of value. These problems have been lamented by many scholars, and recent calls have gone out from world leaders and prominent economists to find an alternative analytical device that would measure quality of life more directly. This Article proposes well-being analysis (WBA) as that alternative. Relying on data from the field of hedonic psychology that tracks people’s actual experience of life — data that has consistently survived scrutiny by passing the social science tests of reliability and validity — WBA is able to provide the same policy guidance as CBA without CBA’s distortionary conversion of preferences to dollars. We show how WBA can be implemented, and we catalog exhaustively its superiority over CBA. In light of this comparison, we conclude that there is no reason for CBA to continue as the decisionmaking tool of choice for administrative regulation.